I’m so glad I have some time to write a blog. These past two weeks have flown by. David and I have been helping teach at our sister project’s bible school and we also traveled to the capital city and back to pick up Melody’s mother which was 3 days round trip. We also have been getting ready for the official opening of the Béré Adventist Nutrition Training Center that will take place December 22nd. (I will blog more about the grand opening for the center later.) In my free time I have been preparing my nutrition classes for the bible school and coming up with a logo for the center as well as helping organize the coming event. The last rain was in October and since then the ground has soaked up all the water that the rains left and now it is a dust bowl here. For the past two days there has been a fog of dust in the air, which doesn’t go away in the morning. When I breathe I can almost taste the dust in the air. It has been so dry David and I have had bloody noses randomly during the last few weeks. Last night I woke up with a sore throat because it was so dry during the night. I know that isn’t very glamorous, but I hope it helps you try to get an idea of the weather here lately. The airplane has been down since the starter was broke in the plane and David needed to replace it before flying it again. He went to Kelo to get faster Internet to order the part and the total cost and shipping for the part came to about $500. We didn’t know where the money was going to come from since it is tight financially for us. But that same day David got an email from our accountant that we had got a $500 donation from a donor we have never heard of before. It is amazing how God works! Only God could have provided the money at the exact time we needed it. I am now 21 weeks along in the pregnancy and am feeling great (besides the heat). Time is moving right along! David and I are looking at tickets for the end of February to fly back to the US to have the baby. The prices keep going up, but right now we are unable to purchase any of the tickets since the amount of donations we are getting are just getting us by month to month. It is really a faith building experience right now and God has given me peace if I have to have the baby in Chad, but hopefully that will not be the case. The baby is due April 23rd and during that time rainy season would just be starting which would make the chance for malaria very high right when the baby is born. Please join us in prayer that we are able to get enough money to go back to the US for the birth. Today I had the distinct pleasure of flying a family of heroes to N’Djamena for their final departure to the United States after 5+ years of service. Jamie and Tammy Parker came to Béré Adventist Hospital in 2009 to serve in meeting one of the most necessary and under-appreciated needs in the mission field: maintenance director. Jamie, a plumber and all-around handyman, has been serving in that role since his arrival here. During that time, the hospital has greatly expanded, adding a total of more than a dozen buildings: new wards, volunteer staff housing, nursing school campus, etc. He has kept up with every need, from building maintenance to landscaping; electrical issues to construction. When he goes on break, the doctors and nurses have to spend their time fixing such issues rather than performing surgeries and seeing patients, which is their greater strength. Without Jamie, the hospital could not have grown nor continued to provide the care it does. While Jamie has been working hard at the hospital, Tammy has been a huge advocate for women and children. She spent years working with the local Adventist school, striving to ensure the kids received a quality, truly Christian education. She ran numerous programs, from providing formula for children under 6 months to mothers unable to breast feed, to helping truly needy families pay their medical bills, and dozens more. She would go to the people where they were at, and find those who truly needed God’s hand of comfort and support. She is well-loved in the community because of her care. She lives a life of championing the cause of widows and orphans. 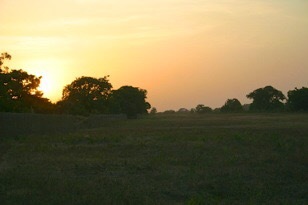 Over the past several months, God has been making it clear to them that their time in Chad has come to an end. They searched every avenue, and God has given them the peace that it was time to go back to the States, for now. As a thank-you for their work in Chad, I gave them a flight to the capital to catch their continuing flight onward. We met at the airport this morning, I having already loaded most of the baggage the night before. Danae came down with the hospital children, including the 4 Chadian boys the Parkers “took in” as their own. We gathered together, prayed, and they said their tearful goodbyes. As we loaded into the plane, Lyol and Zane, the Netteburgs’ two sons, stepped out of the crowd to say one last goodbye, “Peace out, dude!” Tammy’s tears told the story of an inside joke. I cleared the area around the propeller, making sure all children were accounted for by the hangar, and went to start the engine: nothing. Since my last flight, the battery must have drained, so we didn’t have juice to start it. We tried our jumper cables attached to the car, but there was minimal indication of a change. Needing to get going so they wouldn’t miss their commercial flight this afternoon, we took off the top cowling around the engine, installed a new battery and gave it a whirl: success! We re-placed the cowling, loaded up, and rolled out to the runway an hour and a half past schedule. After takeoff, we turned north over the hospital. I circled around it for them to get one final look at their home for the past 5 years, then we continued on to N’Djamena. As we went, we were watching the arrival time: we were cutting it a little close, but we should still be okay. Nearing the destination, I was asked to circle to permit time for an arrival to land; it was their Ethiopian flight arriving! I kept circling and circling until, finally, I was cleared to the approach. After landing, I rushed them in to the terminal, where they were able to check in with minimal (for Chad) hassle and made it on to their departing flight. Throughout all the potential for stress, however, Tammy’s words, spoken at the start of our troubles, stood strong in my ear and my heart. “You know what?” she said, “I know this will be fine, I’m not worried about it. ‘Everything works together for the good of those who love Him.’ Even if we miss our flight, God will take care of us.” Their faith is a true, sincere trust in God that I hope to have one day too. The Parkers return to Tennessee, still unsure (at the time of this writing) what God has in store for them. They go home to their two kids, Cory and Brichelle, who have spent the past year in the US for school. Though they will be missed here, we are excited to see and hear what God has planned for their lives now. They stand strong as people of God, dedicated to His calling. They did all He put before them with all their heart. They used their talents to grow and further the cause of God. They are heroes. And it has been such a privilege to know them, and to be able to provide some of these last memories for their time in Chad. We pray that God continue to bless them.